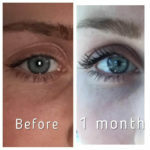 Are you tired of short eyelashes and patchy, thin eyebrows? Do you wish that you didn’t have to pile on mascara or use false eye lashes? 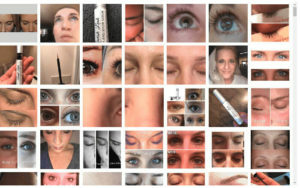 Forget about eyelash extensions! 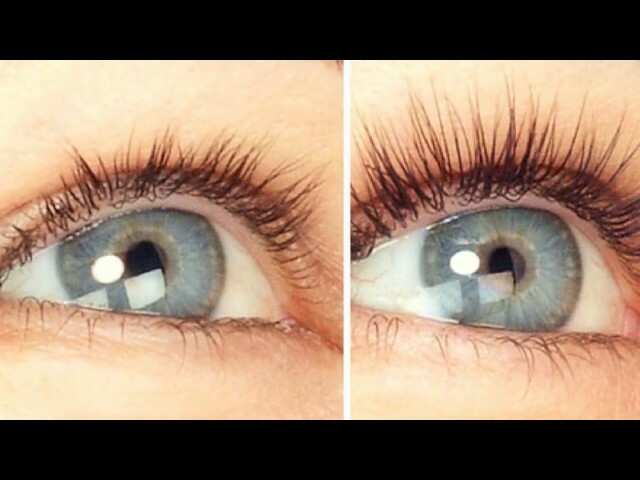 Get the long and luscious eyelashes you want with Lavish Lash. The secret to longer eyelashes lies in the unique formula made with top-quality and natural ingredients including plant peptides and biotin. 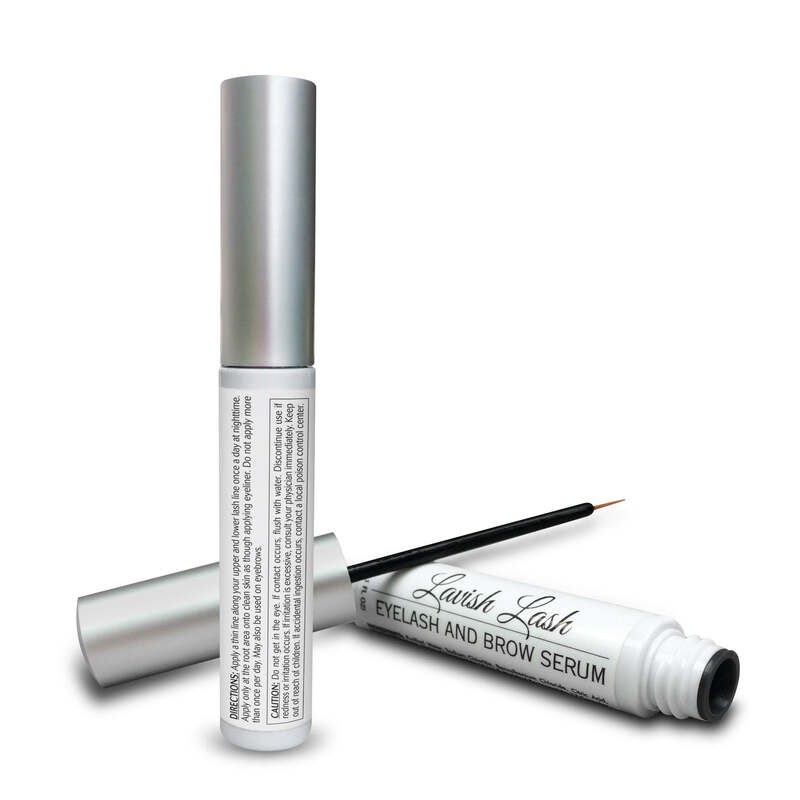 Get a huge Lash Boost with Lavish Lash Growth serum today! 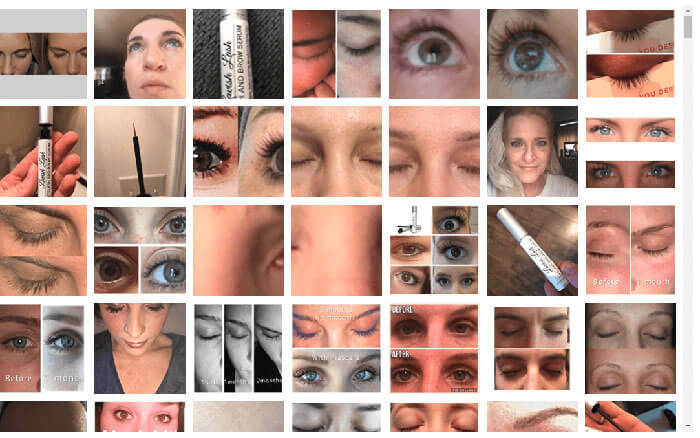 Thanks to our cutting edge technology and years of research and clinical studies, Lavish Lash is now a reality. Once you try it for at least 2 months, it will be an irreplaceable part of your nightly beauty regimen. The active serum will make a huge improvement to the length of your lashes, their thickness and density. Lavish Lash Eyelash Serum and Conditioner will also impart sheen and luster to lashes and brows making them appear lush and beautiful. 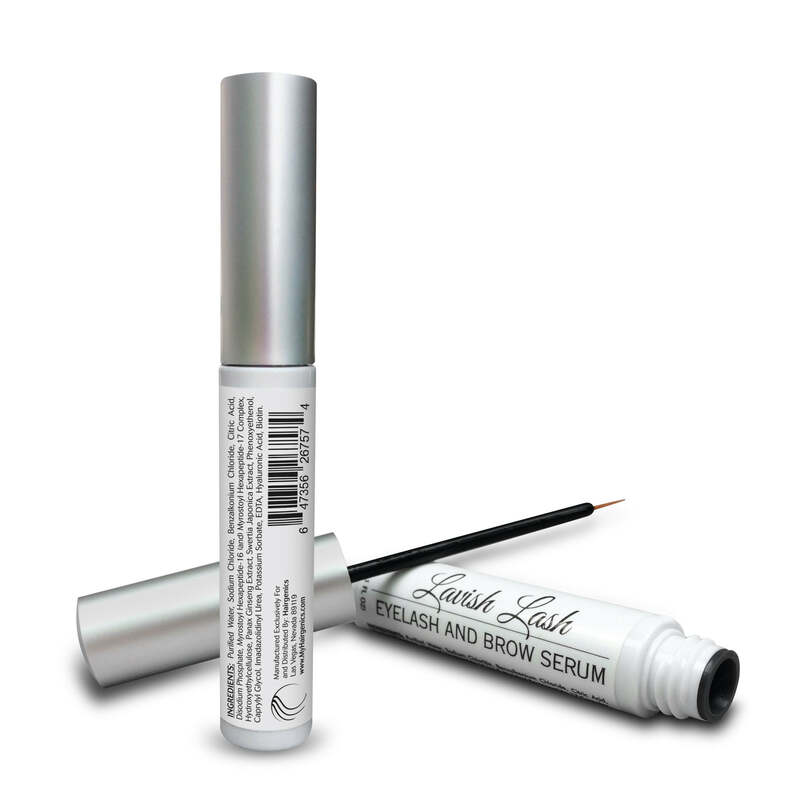 Lavish Lash is simple and easy to apply, and is hypoallergenic and completely safe and effective. Apply to the base of your upper and lower lash line at the root every night as though applying eyeliner. You can also apply a thin line to your clean eyebrows for thicker brows. AVOID CONTACT WITH YOUR EYES! 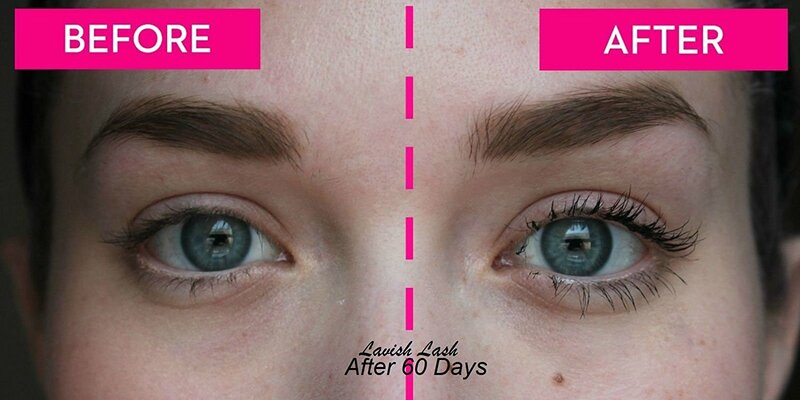 Use for a minimum of at least 60 days as the eyelashes and brows are the slowest growing hairs on the human body, and best results can be seen after 90 days. As with all Hairgenics products, your satisfaction is guaranteed or your money back! Directions: Apply a thin line along your upper and lower lash line once a day at nighttime. 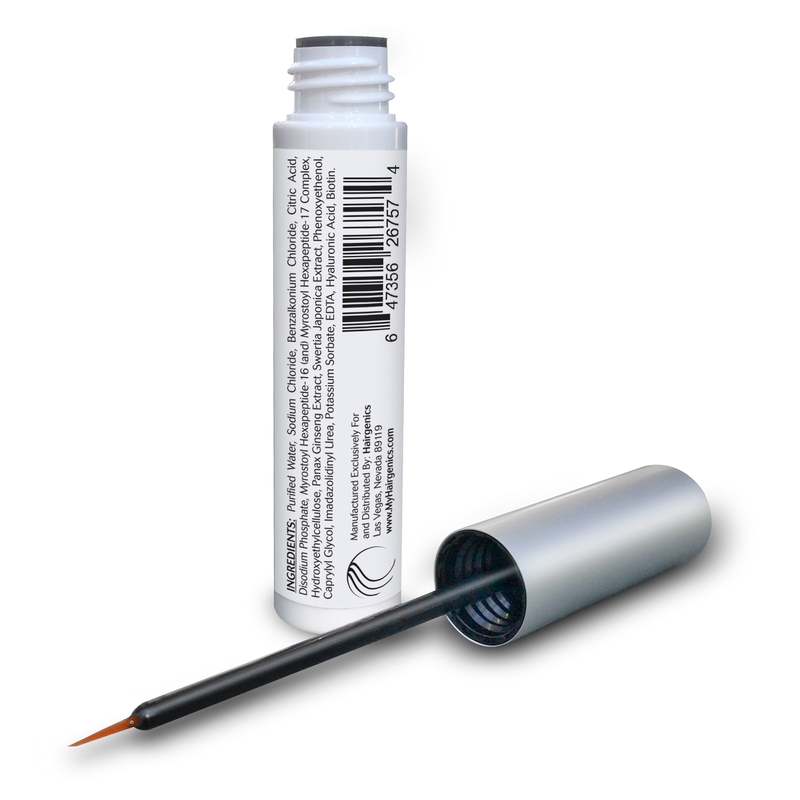 Apply only at the root area onto clean skin as though applying eyeliner. Do not apply more than once per day. May also be used on eyebrows. Caution: Avoid contact with eye. If contact occurs, flush with water. Discontinue use if redness or irritation occurs. If irritation is excessive, consult your physician immediately. Keep out of reach of children. If accidental ingestion occurs, contact a local poison control center immediately. With thousands of happy and loyal Hairgenics customers swearing by our products and this eyelash enhancing serum in general, there are loads of happy results, reports and before and after lavish lash review pictures coming in. Below we will try and list some of our reviewers results with whom we can verify used only our products. 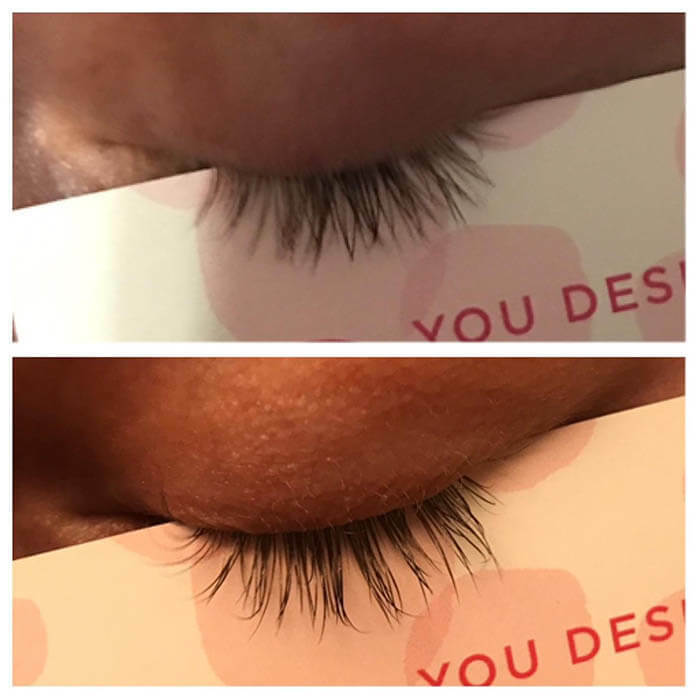 If you have tried Hairgenics Lavish Lashes extension serum yourself and could leave your own testimonial or evaluation, our prospective customers would love to hear from you! Hi there, got a personal recommendations for LavishLash from 2 girlfriends of mine whom started using it together and swear that ir really works as well as some of the amazon reviews are saying it does. I would love to start as I do notice a significant difference in their eyelashes beauty after they have been using it for 3-4 weeks. My question is I cant seem to find the ingredients of lavish lash anywhere? I would love to order but there are a few active ingredient additions I have to be careful of with my over sensitivity. 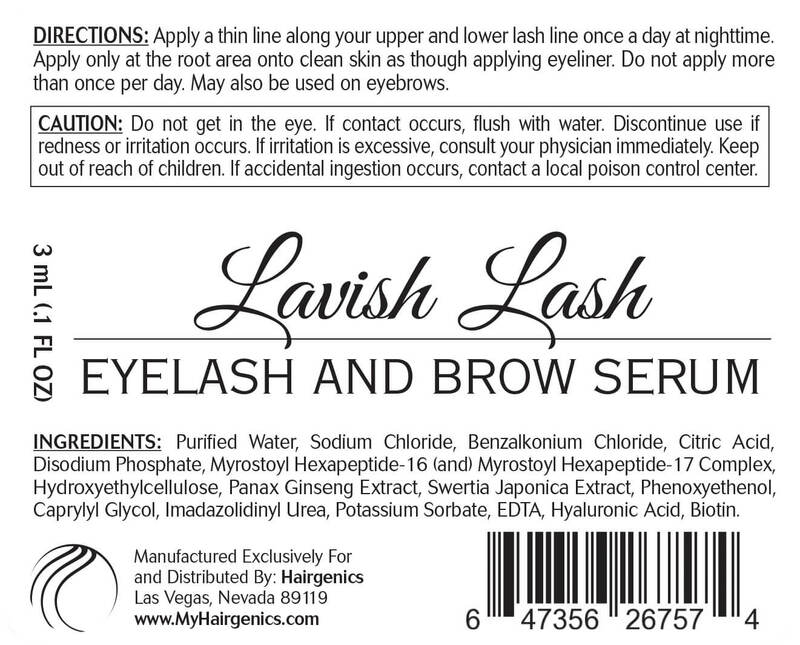 Hi Brenda, below is a list of the Hairgenics Lavish Lash serum ingredients as found on the label of the product. We hope you experience the same kind of great results as your friends and thanks for your interest in our products! Yes! Yes! Yes! Love this stuff!!! I’m a licensed skin care therapist and am always on the lookout for the best products at the best cost and so are my clients. I have had short blonde lashes and scarce brows my whole life, but not anymore. Say goodbye to prescriptions and overpriced pyramid schemes. This stuff works!!! I love the simplicity of the ingredients in the product as well. I apply it after the shower so the skin and hair follicles are free of any makeup or oils. I have used it liberally everyday for three months now and am tickled pink. One tube lasted that long. I do recommend tinting the lashes if they are a lighter shade like mine. I also pair it with a good hydrating eye cream. I work for Hand and Stone massage and facial spa and seriously recommend that this company get this product into their hands and on their shelves because I would sell and recommend the heck out of it. Lavish Lash is an amazing product that I started recommended to all my clients and visitors. I own a salon and I’m trying to buy this in bulk to offer my customers, it really is that good and fairly priced at this quality. This product is just the best I have tried in so long and I have opted to try the pronexa shampoo and hair growth supplement / shampoo as well because of the companies dedicated to quality and rock awesome customer support. I’d like to post a picture of my Hairgenics Lavish Lash before and after results like in another review I saw on amazon.com but I cant figure out how to do so? Bought this at amazon and all I can say is this stuff works! My lashes is longer and even my husband noticed it, so he is using it too! Highly recommended. It was such a bad idea to try the glued-on false eyelash extensions because I lost my long natural eyelashes. I tried everything from Latisse (friend of mine works for a physician) to all kinds of eyelash growth products, including oils to no avail. If there was even a slight growth, whatever was there would be on my towel after washing my face. Every night I looked up reviews and finally came across Lavish Lash so for the price why not try it, after all this company is in the hair growth business. 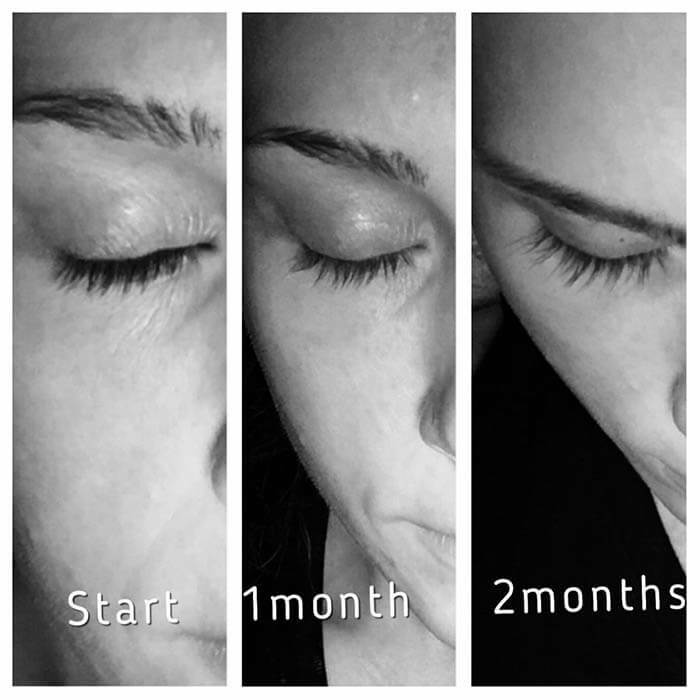 I purchased the Lavish Lash Serum and started to use it nightly from July 26th. I even took photos of me to see if there would be the slightest growth. Today is the 14th of August and OMG I have my lashes back! I wish that I could post the before and after with this review so that all doubters can see the difference. THANK YOU Hairgenics, I really am truly grateful! Ended up buying this after reading thousands of positive reviews on Amazon.com – have been really happy so far and will be ordering more again now, just 4/5 stars instead of a perfect 5 out of 5 review because shipping took a while to Canada. If they improve their international shipping this eyelash serum is as good as it gets really and I’m happy I found it. I just started to use this product and am about 3 days in already and I’m really excited about the possibility. I’m wondering how long this will really take to work and I have read various testimonials that seem to suggest that you do have to wait a bit to see a result with this and the blissful brows by Hairgenics products. 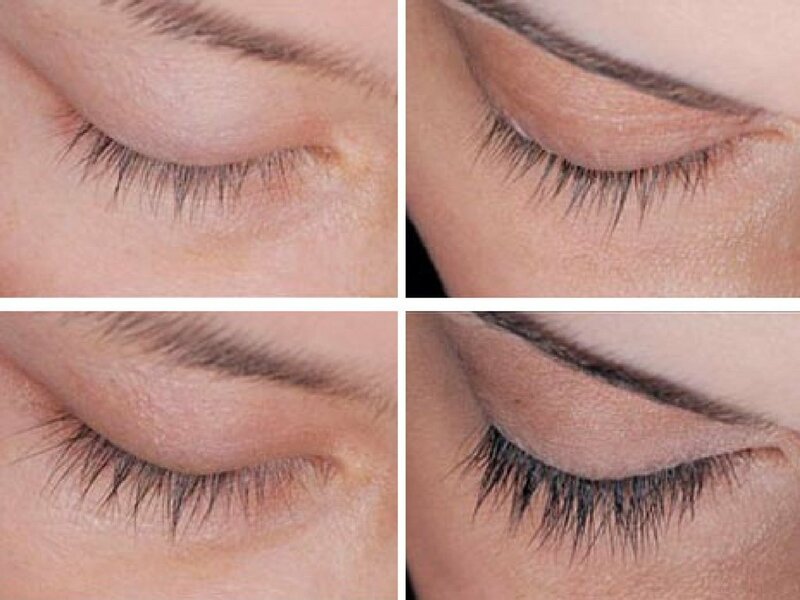 Do you have any Lavish Lash before and after pictures from real customer results? I’m super excited to see what could potentially happen as I continue to use this more and more often. Was skeptical of all the Amazon reviews being so overly one sided, decided to buy lavishlashes anyways and am glad I did. Still think their are some over the top scam reviews but it actually does work Haha.. and really well! I am just finishing my second Lavish Lash and I could not be happier with the results. 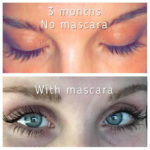 My lashes have easily doubled in size, are thicker, and stay curled which they have never done. I use it every night and have not missed any days so if you use it per instructions it absolutely works! So happy I found this product. 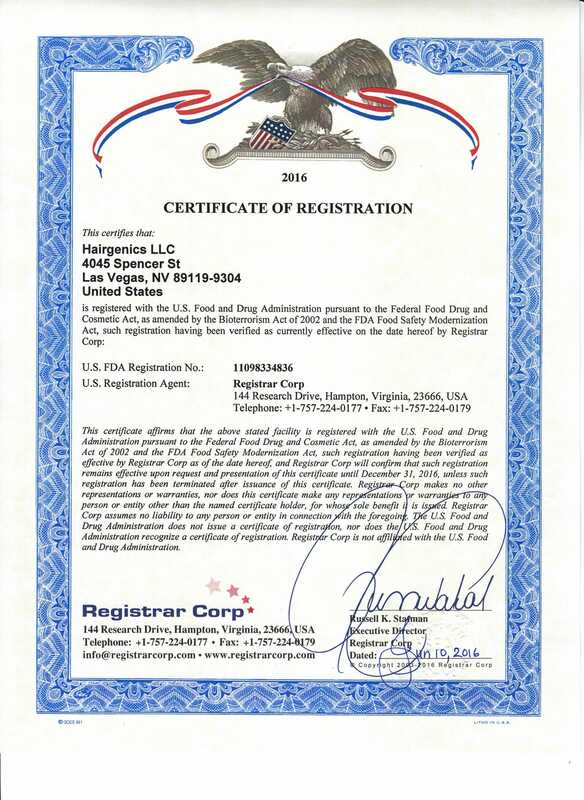 © 2018 MyHairgenics.com - All rights reserved.Our products and statements have not been evaluated by the food and drug administration. Our products are not intended to diagnose, treat, cure or prevent any disease.